Ever since I built my Elemental Dragon of Classic Space back in January of 2017, I’ve been contemplating a Blacktron counterpart, but so far I haven’t produced. I’ve made a couple of abortive false starts, but nothing that’s actually any good. This past week, however, it occurred to me that the hypothetical Elemental Dragon of Blacktron wasn’t the only way to combine Blacktronian spacecraft design with the idea of dragons. Borrowing some of the more ornamented design ethos of the Sunhawk-class (but with a vastly different actual design), this Blacktron battlecruiser was designed around that decorative dragon’s head form of the upper frontal hull and then took in the bat-wing vanes toward the rear. I was initially half thinking about a raised dragon’s tail at the rear as well, but then I built the ship’s engine section a little differently to what I had thought after those rather Y-Wing styled engines took shape, but then I realised that I could still add the tail so I did. But it didn’t look as good as I had first hoped so I removed it again. 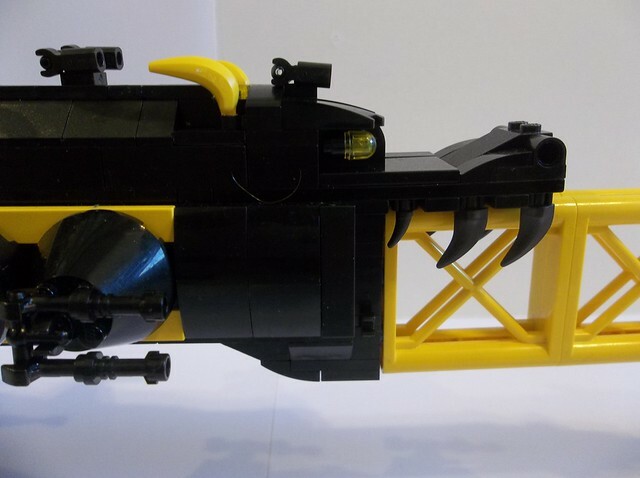 At 32 1/2 inches long (which this handy LEGO stud calculator calls 103 studs), the Blacktron Dragon-class battlecruiser turns out to actually be a SHIP. 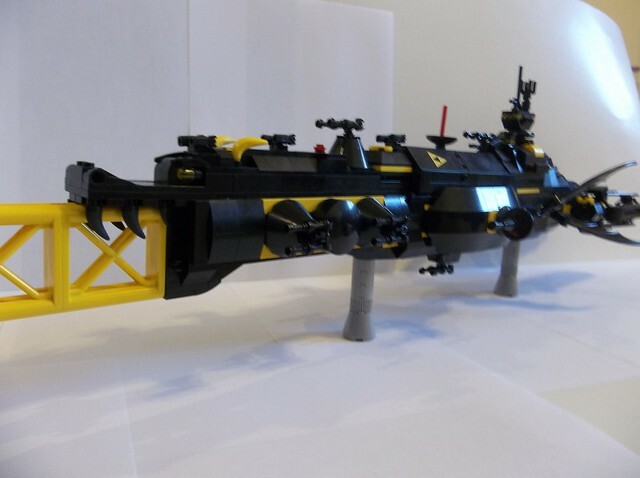 I was slightly surprised at this because I’d got hold of the idea from somewhere that 100 studs was 37 1/2 inches, not 31 1/2, so some of my previous SHIPs and near-SHIPs get their stud length estimates revised upwards. The horribly designed Liberator is still 101 studs long (I measured that in studs to begin with), and Dark Pegasus clocks in at 126 studs. The Blacktron Alliance’s smaller absolute size compared to its sprawling Federation adversary has made it far more aggressive in its interstellar dealings due to its perception of the size disparity as a disadvantage. When it comes to large combat ships, however, the size disparity tends to go the other way and pile it on: Blacktron spacedoing dreadnoughts and battlecruisers are often more powerful on a class-by-class basis than their putative Federation Space Fleet counterparts, and almost always proportionally larger to make up for the smaller number of hulls that the Alliance is able to field. Federation officers going toe to toe with Blacktron dreadnoughts often report the ship size disparity to be somewhat intimidating, and it is perhaps due to awareness of this fact that later Blacktron vessels have the designs that they do, a prime exemplar being the latest generation of Blacktron battlecruisers of the Dragon class. 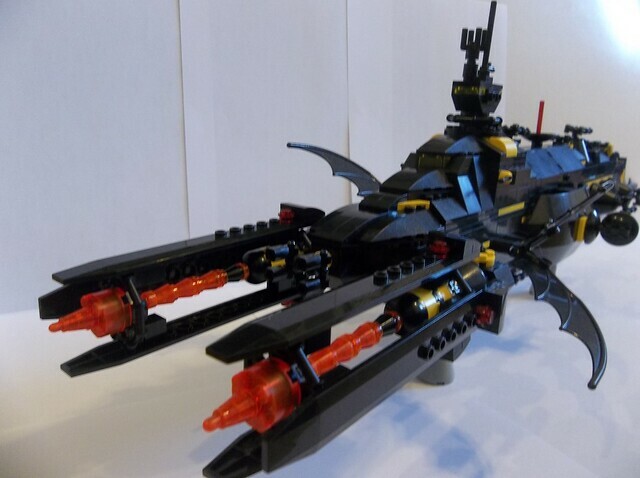 It should be said, however, that the Blacktron Alliance has always had a more flamboyant design ethos than the stark functionality favoured by the Federation (compare the Federation’s Galaxy Explorer class with the similarly-sized Blacktron Renegade), and many observers see the more ornamental design of the Dragon-class as merely a continuation of that flamboyant attitude. 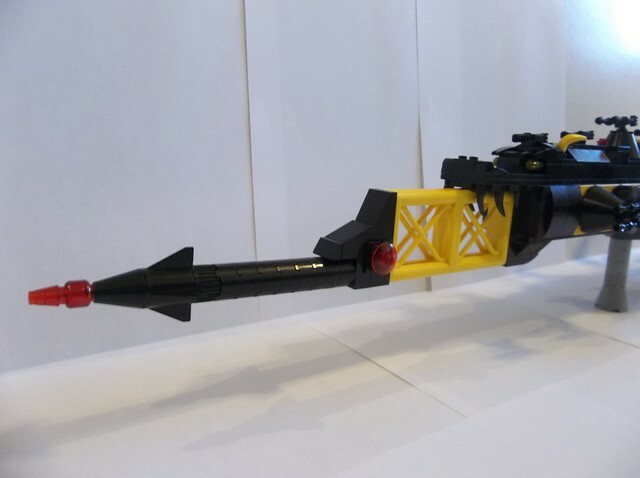 The class is recogniseable not only for the characteristic dragon’s head design of its upper forward hull, but more importantly for its massive spinal graser weapon system. For more conventional weapons, the Dragons are armed with 2 dreadnought-calibre antimatter accelerators and 12 battlecruiser-calibre laser cannons in dual-mounted turrets, backing these up with smaller secondary weaponry serving as antifighter and antimissile defences. The initial production run of the Dragon-class currently stands at twelve vessels: Jormundgand, Ouroboros, Tiamat, Smaug, Weng Chiang, Mnementh, Gojira, Quetzalcoatl, Night Fury, Leviathan, Kongyong and Strabo. 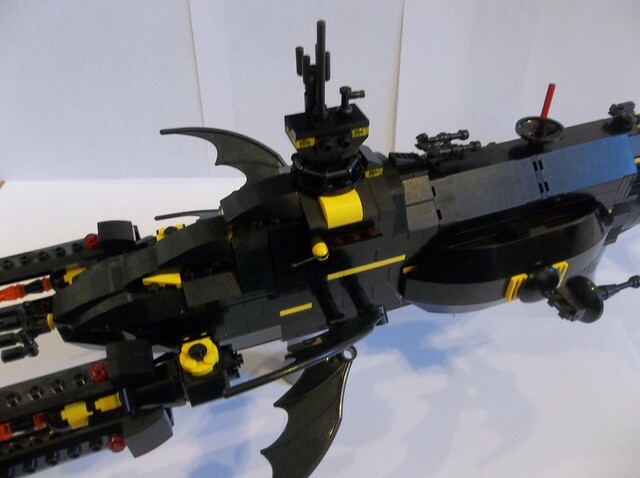 This entry was posted in Blacktron, Dragons, Lego Classic Space, Lego Space and tagged Blacktron I, Lego, Microscale, MOC, space battleship, Spaceship on March 31, 2018 by geoffhorswood. Woooow! This is something else! Like, really something else! Where do I even start? That dragon head is totally boss, and the Y-wing style thrusters look fantastic on a cruiser of this size! The sloping and general battleshipish shape of the whole ship is very well done, and flows surprisingly well for a build of this size. The batwings are really icing on the cake. Also, NPU with those bananas. Thanks! I initially thought about using the bananas as fangs, but they didn’t work because they were too sharply hooked. Then I developed the gantry area and realised they’d be the wrong colour anyway. But they make pretty good horns!